Reset T-Belt service light Toyota Land Cruiser 200 series. From year: 2008, 2009, 2010, 2011, 2012, 2013, 2014. 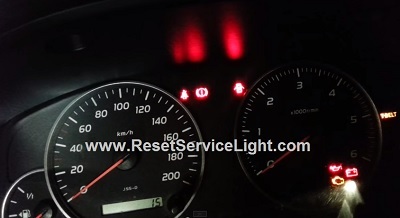 How to reset T-Belt warning light Toyota Land Cruiser 200 series, follow the below tutorial. Change the display to ODO using the tripmeter reset button, see below picture. Push the tripmeter reset button and keep the button pressed down, see where is located the tripmeter button below in this picture. Turn the ignition to on position without starting the engine, hold the button for about five seconds. Press the tripmeter reset button and release, the display will show a number, see below picture. Now press again the tripmeter button and hold down for about 5 seconds, until on the display shows the ODO. You succeeded to reset T-Belt warning light Toyota Land Cruiser 200 series. That it is the full procedure how to reset T-Belt warning light Toyota Land Cruiser 200 series. If you like to reset any maintenance oil light after an oil change. Or reset check engine light, airbag light, inspection key or insp errors when maint reqd, for Toyota cars. Or any warning light for service reminder which appears on the display. Write in the search box the car name for which you want to find information, and find how to reset other service reminders by yourself. Hello, can you tell me what car do you have ? Hi, I have Toyota Land Cruiser uzj200 (2007), how can I reset the belt light, waiting your response with thanks. Hello Muhammad, some model have an indicator for timing belt and all of them for seatbelt. For which of these you want an answer ?